Recently, I have been too busy with life to have time to sit down for 30 minutes and enjoy a facemask… I know, I know, a girl should always find time but I am literally struggling to even find time for sleep! Anyway, the whole point of this post is to tell you about a new discovery – one that I don’t think I can live without now. 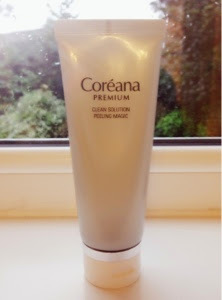 It’s the Coreana Premium Clean Solution Peeling Magic. I went into Sasa in Hong Kong asking for something that would renew my skin and give me a nice glow and this is what they recommended. I had never heard of the brand but it was 300 HKD for 2 tubes of it and she said it was the best selling exfoliant in Korea. Now, I’m not usually the one to believe the sales people in Hong Kong as they are often just trying to sell as much as possible! But for some reason, I decided to take her up on the offer and bought 2 tubes. Best decision ever. It comes out as a gel formula and I put a pea sized amount onto my fingers and rub it gently into my face starting from the middle. It spreads smoothly onto the face and as you work it into your face, you get balls of dead skin come to surface which is such a good feeling! I find it works best after you’ve removed all your make up and then patted your face dry with a towel. My face looks instantly brighter, clearer and you get a more even skin tone after using this about 3 times a week. As for the smell, there is a slight fragrance but it’s nice and not too over powering. Considering this is a mild form of ‘acid peel’, it doesn’t really smell acidic which is always a plus! If you’ve read my blog before, I’ve written a review on a similar product back in January which you can go and check out here. However, this is the much more affordable version which I think does a much better job at clearing my skin.